Situated in the old Rochdale Cider Factory, this is one of the iconic New Zealand craft breweries. Originally called Mac’s Brewery and founded by former All Black Terry McCashin, this brewery and eventually brand were bought out by Lion Brewery in 1999 and eventually the original site was closed down. Last year Terry’s son, Dean McCashin and wife Emma made the decision to reopen the brewery under the McCashin’s name and are currently producing three beers. Stoke Amber, Stoke Dark and Stoke Gold are brewed under the watchful eye of head brewer, Sam Wilson an employee who was with the company in its early days with Lion and eager to return to the brewing that he loves. Initally a homebrewer, he has the luxury of developing and creating recipes on a beautifully engineered 100 litre pilot plant, complete with temperature controlled fermenters. His experimental brews are on at the impressive brewery tap which not only has bottle and flagon sales, but also the range of fruit ciders that they produce and a cool little coffee shop. The retro styling is awesome, as is the artwork created by their own resident artist that is scattered around both shop and brewery. The main brewing system is 5000 litres in brewlength and they run two lauter tuns in parallel, allowing 10 000 hL to be easily brewed in a day. They also have some 20 000 litre tanks that can hold four brews. Impressive capacity for a craft brewery! All of the beers were well crafted with the lovely toffee characters of the Amber beer really standing out. The Dark also showed great roasty notes and a great dryness. Sam also had a Pale Ale and Wheat on and told us he’s really keen to push the Wheat into the marketplace. A history of premium beverages. McCashin’s Brewery was born in 1980 when hotelier and former All-Black Terry McCashin and his wife, Bev, bought the Rochdale Cider Factory in the small upper-South Island city of Nelson. With Jim Pollit, of Carlsberg fame, as Head Brewer, along with the plan to brew distinctive, high-quality beer, McCashin’s Brewery soon became the most successful independent microbrewery in the country. Its award-winning 100% naturally-brewed beer revolutionalised the way beer was produced. And both its beer and cider won the hearts and tastebuds of the nation. Today, McCashin’s continues to pioneer beer- and cider-making and has extended its range to include fine wines, spirits and the purest water in the world. Revolutionising beer. In the early 80s, under the guidance of Head Brewer, Jim Pollit, McCashin’s Brewery began brewing the first unsweetened beer as well as a range of other beers not seen in New Zealand at the time. The beer was brewed using only malt, hops, yeast and water, which conformed with the Bavarian Purity Laws of the year 1516. Because the beer didn’t contain sugar, which sped up the fermentation process, the beer was produced over 12 long weeks and nurtured to perfection. The McCashin’s success inspired a new generation of brewers, with many of these brewers having learnt their trade from McCashin’s Brewery. The Rochdale influence. When the McCashins bought the Rochdale Cider Factory in 1980, the factory had been making cider for 50 years, brewing right throughout the second world war and into the 70s, when Rochdale was the only cider producer in New Zealand. The McCashins continued to brew Rochdale cider, improving the recipe along the way, and even won several awards in the 90s for its sparkling cider. Now, McCashin’s has revitalised the cider with its Frute range of delicious fruit-flavoured ciders. Stoke Amber - We hope you enjoy this Stoke Amber. We make it the old fashioned way and never cut corners. It’s brewed using Nelson’s famous organic hops, premium malt, our own bespoke yeast an 14,000 year old Paleo Water (no artificial additives or colouring). Stoke is tank conditioned over three weeks - that’s where the hint of honey and smooth mouth feel come from. Next time you’re in Nelson, come and meet the team here at our family brewery! 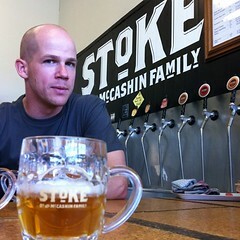 Stoke Gold - Stoke is tank conditioned over 3 weeks - that's where the hint of honey and smooth mouth feel come from. Next time you're in Nelson, come and meet the team at our family brewery.